4380-SD-DST is rated 4.4 out of 5 by 56. 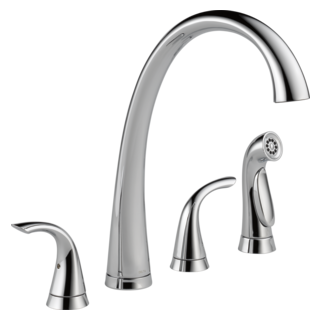 Rated 5 out of 5 by Bill from Great faucet I had a Delta faucet before this one and always had great luck with it and great quality. 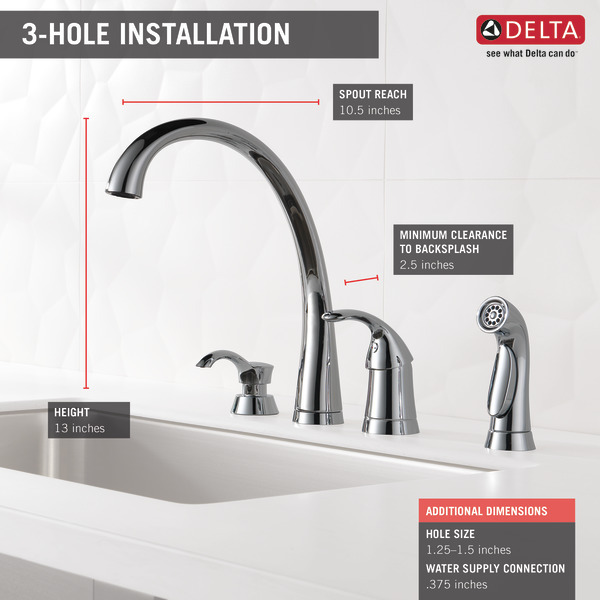 Rated 5 out of 5 by CharlieDIY from Escellent faucet and easy to install I am not a plumber, but I found the new 4 hole faucet easy to install with the new features available now. I replaced a 20 year old delta with this new one. The directions were clear and simple to follow. Taking the old one off was harder than the new install. Thanks Delta. Rated 5 out of 5 by jgwicks from Solid work of faucet art I purchased this faucet for my kitchen makeover six months ago. It is not only beautiful, but it has worked perfectly with no leaks. The only thing to get used to was the hair trigger response of the sprayer, soaked the walls and myself a few times. I am very happy with the function, styling and overall solid feel of this facet. Rated 1 out of 5 by Emmabean from Cheap Material I wanted to surprise my wife while she was away at work and hired a Plummer to install this replacement cause. Boy was I surprised, the soap dispenser and sprayer are made of plastic and looks like a dollar store purchase. My wife is by upset. Delta's quality has gone down. NEVER again, what a huge disappointment! Rated 1 out of 5 by Unhappy customer from Plastic Materials The soap dispenser and water sprayer is plastic and looks and feels incredibly cheap you should be ashamed for offering such poor fixtures! 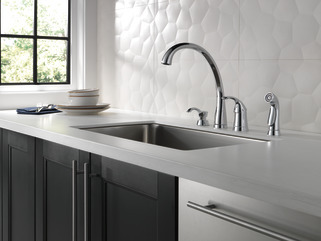 Rated 5 out of 5 by DonnaAZ from Just what I wanted I love this faucet! It's exactly what I wanted and fits my needs. I did not get the option with the soap dispenser, so I can't comment on that. But the faucet, itself, is the perfect height to afford the space needed to wash things comfortably, and the sprayer is not overpowering. I definitely would buy this again. Is artic stainless similar to brushed nickel? I have nickel cabinet hardware. Does the 4 piece Pilar come in artic stainless? Where is this faucet made? 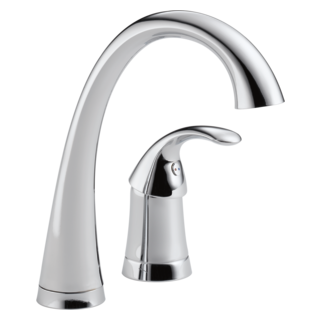 Is there a way to adjust the aerator so that the water isn&rsquo;t splashing out of the sink. 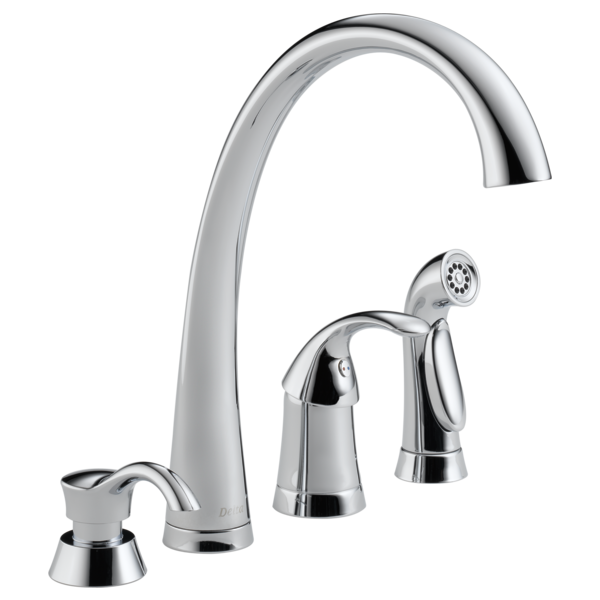 Pilar Waterfall Single-Handle Standard Kitchen Faucet with Side Sprayer and Soap Dispenser in ? I love this faucet. Does it come in stainless or brushed nickel? Can this faucet be connected to pvc pipe? I broke the black plastic part that the aerator screws into. Can this part be replace or do I need to purchase a new faucet? Is the spout supposed to be loose?